Just had to take a couple bites and a pic! I know it's been quite a while since The Veganishta has posted anything. Luckily today, the "lab bug" struck, and Veganishta went to work in the kitchen. I had a taste for breakfast sausage, first time in eighteen months, so I set out on the excursion through my fridge. I gathered the leftover roasted carrots, shitake mushrooms, and yellow onions I made last night, along with some black beans and corn. I threw it all in the food processor then boiled some tofu for five minutes then threw that in. I blended the heck out of it and then added some thyme and fresh ground fennel seed. I thought the fennel would give it that sausage flavor. It worked! 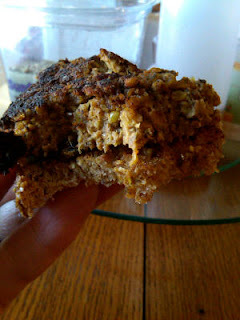 A laboratory success in the kitchen this morning allowed me to eat my large breakfast sausage patty on a slice of Ezekiel toast. I simply love experimenting with veggies, beans, legumes, and grains. I am just so very excited that I had to share this quickly today. I used my phone camera, so lighting and setup is not very professional looking, but you can see how it turned out here. This sausage patty is now on my list to document the ingredients and recipe that I'll share later on.